Asymmetric and platform-driven business models are among the most important topics in the mobile industry today but as I've pointed out before, they're also very poorly understood. Depending on how platforms subsidize, build network effects and monetize, they can be categorized into different buckets. But each platform category also tends to favor a different approach to gain critical mass and stave off competition. These complications make it very challenging for the uninitiated to understand, leverage or respond to threats from platforms. My colleague Michael Vakulenko just started a very interesting project, Platform Hunt, to tackle these problems. Platform Hunt is a platform — a platform for crowdsourcing research on platforms. We structured Platform Hunt as a taxonomy of platforms, which captures key platform properties, insights about how different platforms are born, live and die, together with example of platforms across all the platform categories. Platform Hunt will help entrepreneurs to find new ideas and learn from experience of other platforms, help investors to evaluate their investments and help corporate executives an early warning system for spotting threats and opportunities presented by a new startup that may look like a toy in its early days. All the data is public on www.platform-hunt.com. The project begins with an initial taxonomy of platforms and examples of different platforms types. Anybody can submit a platform example together with comments and suggestions by filling a form at add.platform-hunt.com. Moderators review the example and classify it into one of the platform types. Each example helps either to get more confidence in the taxonomy or find anomalies, which in turn will help to improve the model. Needless to say, this is a very worthwhile endeavor and I will be contributing to the project as a moderator. You can learn more about Platform Hunt here or go straight to our public board. 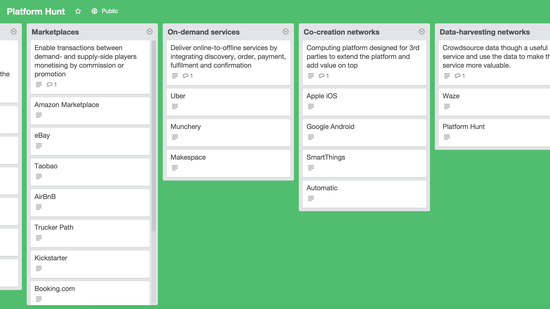 We're starting lean by listing about 30 platform examples in 7 categories, but we hope to expand on this and add other ways to add community feedback as well. One of our goals is to identify platforms that don't fit our categorization model which could help us improve our methodology. You can contribute to this crowdsourcing project by filling the form here. With your input, we believe Platform Hunt can make a genuine impact on the tech industry and startup ecosystem.